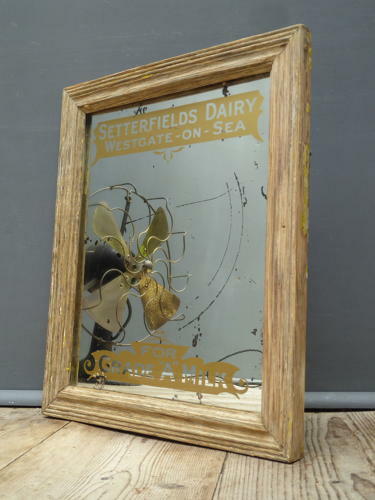 A beautiful antique advertising mirror for The Setterfields Dairy of Westgate On Sea. A lovely Edwardian advertising mirror featuring an thick glass mirror plate embelished with gilt advertising & set in its original solid oak frame reatining traces of original paint. A lovely early piece of advertising with bags of character & a beautiful rustic look about it, just perfect for the kitchen!. Good original condition with some marking & foxing to the mirror plate.